As the Nashville weather turns warmer and the days grow longer, it’s time to pack away your winter clothes to make room for spring and summer things — just make sure to store your cold-weather clothes properly. They’ll look better, wear longer, and will be ready to go when winter rolls around again next year. First, you’ll want to launder your winter clothes before you pack them up — even if they were never worn and/or don’t appear to be soiled. Clothes can sometimes have spots or stains that aren’t readily visible. Use unscented detergents, and skip fabric softeners and other additives that could attract insects. Take items that can’t be washed to the dry cleaner. Next, you’ll put your clothes into storage containers. Ideally, use bags or boxes that won’t degrade and will seal out dirt, dust, insects and moisture. Fold clothing neatly before adding it to the container and pack “loosely”, allowing air can circulate. Tuck a lavender or cedar sachet into each container to help repel bugs. Both lavender and cedar are safer for use than mothballs and they smell much better. 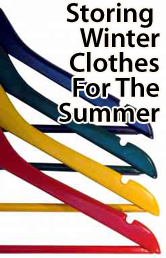 For bulky items such as coats, use padded hangers and cover the clothing with heavy plastic wardrobe bags. If you don’t have padded hangers and don’t want to buy them, drape wood hangers with folded towels to fill in the shoulders of your coats without stretching them. Keep the storage boxes and hangers in a dry place, away from sunlight. Sunlight can fade your fabrics. Then, make sure to clean your closets thoroughly before filling them with the next season’s clothes. Dust the shelves and ceiling, wipe bars and flat surfaces, and give the floor a good vacuum. Your closet will be clean and fresh and ready for the new season.